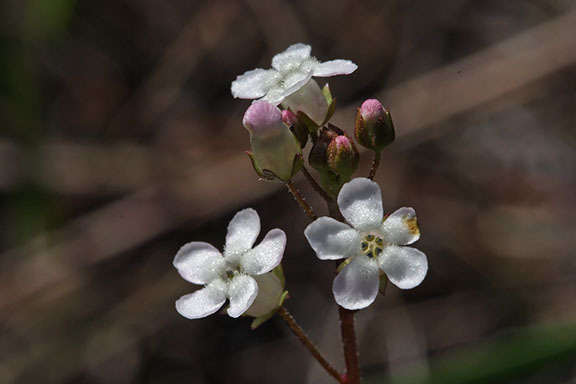 Found in brackish and freshwater marshes, wet pinelands, ditches and disturbed sites throughout south Florida south of Lake Ockechobee and in the coastal counties as far north as Volusia on the Atlantic and along the Gulf coast to Gulf County in the panhandle. The range also includes Louisiana, Texas, Oklahoma, Kansas, New Mexico and Nevada. Samolus ebracteatus has small, five-lobed white flowers 5-7 mm (~ 1/4 in.) wide on pedicels without bracts. The cauline leaves of this species do not sextend into the inflorescence. Basal leaves are 2.5 - 7.5 cm (1 - 3 in.) long and wider above the middle. Another species of this genus - S. valerandi var. parviflorus has smaller flowers 2-3 mm (less than 1/8 in.) wide on pedicels with a small bract near the middle and the cauline leaves extend into the florescence. 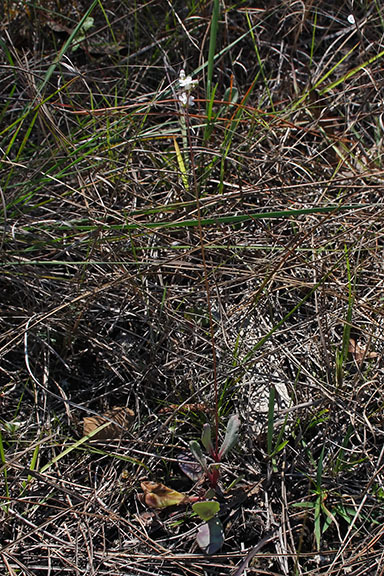 Called pineland pimpernel or seaside brookweed, it is found in most Florida counties. Samolus ebracteatus is a member of the Primulaceae - Primrose family.